Last week, in writing about a couple of brushes I had with George H.W. 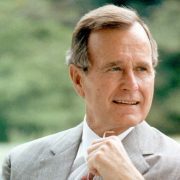 Bush before he was president, I mentioned that while I was working at the U.S. Mission to the UN for a couple of months in the fall of 1971, I’d usually have lunch at one of mid-town Manhattan’s many restaurants. Still young and relatively inexperienced, I found some of the cuisines on offer fairly exotic. I recall being highly impressed, for example, at seeing an Albanian restaurant, although I never got around to eating there. Albania, of course, is a small country that is far off the well-trodden path of European tourism. And it was even farther off that path in 1971, when Albania was ruled by a Communist Party whose cruelty, radicalism and isolation rivaled those of the North Korean regime. Albania had actually severed ties with the Soviet Union, which it considered “soft” in its opposition to the United States. Its only friend in the world was Mao Zedong’s China, then in the throes of its “Great Proletarian Cultural Revolution.” (And after China started playing footsie with the Americans following Nixon’s visit in 1972, Albania cut itself loose from its Chinese alliance too, facing the rest of the world utterly friendless.) My American Peace Corps friends in India and I would sometimes amuse ourselves in the evening by listening for a few minutes to the absurd anti-American diatribes, in English, broadcast on shortwave frequencies by Albania’s Radio Tirana. But I’ve digressed, since it’s my intention to write here not about Albania, but about a restaurant that features a far less exotic culinary staple — the hamburger. The restaurant in question was a White Castle, an outlet in an unusual chain that, judging by its restaurants’ external appearance, appears to be at the humbler, tackier end of the fast-food spectrum. This would be a misleading impression, however. I’d first seen a White Castle as a boy, riding with my parents from time to time between my maternal grandparents’ home and the apartment of my mom’s brother, Uncle Willie, and his family, both located in the Bronx. 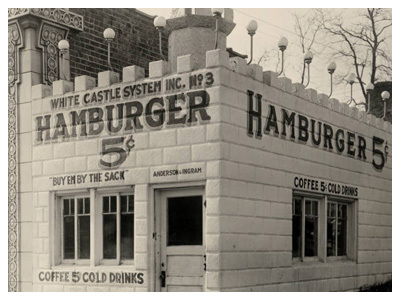 From the old photo above, you can probably imagine how the White Castle’s distinctive architecture might appeal to a small boy. I’d occasionally ask my parents if we could stop there and sample the food — a request that was invariably turned down in a way that made it plain that people who value good nutrition, cleanliness and respectability (not necessarily in that order) would never cross the threshold of such an establishment. So imagine my delight in 1971 when I discovered, just a block or two away from the U.S. Mission to the UN, another White Castle. Tucked into the ground floor of a typical mid-town New York office building, it lacked the fanciful architecture of its stand-alone cousin in the Bronx that had so appealed to me as a boy. Still, it was clearly the real McCoy, so it didn’t take me long to walk in and order lunch. What made the place memorable, however, was not just the fulfillment of a frustrated boyhood wish, but a character I encountered there a few times. (Yes, I went back more than once!) This was a wiry, middle-aged guy who, long before it became trendy, always looked as if he needed a shave. Somewhat shabbily dressed, he’d be sitting at the counter smoking a cigarette and nursing a Coke. As he’d sip at his drink and watch the level drop, he’d pour some water from another glass into the Coke in pursuit of a free refill. A watered-down drink did not, however, appear to be entirely satisfactory. In an apparent effort to fortify the libation, he would repeatedly flick the ash from his cigarette into the glass and stir it into the liquid. 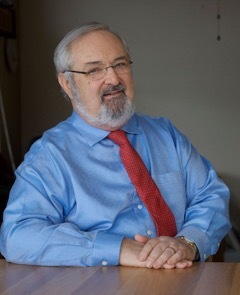 I found this fascinating and couldn’t take my eyes off his performance till it was time to walk a block or two to the office to begin my daily reporting on the goings-on in the General Assembly’s six standing committees. From the ridiculous to the sublime — well, the UN long ago lost its sublimity, so perhaps it would be better to say, “from one kind of ridiculous to another” in under five minutes. And a new “cultural experience” added to all those I’d had in India and my travels across 13 countries in Asia only a few months before!